Apologies for the late update on this one. 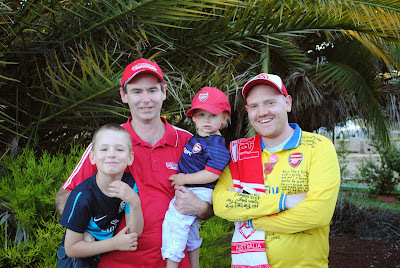 It would seem that the lack of sleep and abundance of Australian beer has seen me forget to press the 'publish' button on this 'meet the Gooner family feature'. Sorry Phil. Better late than never though, right?! 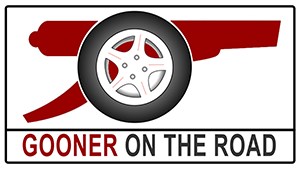 Meet Phillip Saunders, my first host for the Australian leg of my round-the-world Arsenalfest. Phillip lives in the city of Albury in New South Wales, which, if you looked on a map, would think it's in the middle of nowhere. And that's because it's in the middle of nowhere. But, it is approximately half way between Sydney (where my flight from Fiji landed) and Melbourne, the next destination on my list. Phil had heard of my cause and offered a couch to crash on and, of course, a Gooner to watch a game with. Partly because of the shirt. I like the iconic red shirt, white sleeves. I didn't follow them because they were doing well. They're a strong, traditional yet progressive club. It was mid-eighties. I remember Samantha Fox was a fan, and that was one of the reasons for me getting into Arsenal. Niall Quinn. He was so different, he was an unco-ordinated lanky goofball looking thing, but he never gave up and he was an iconic player. I like Sagna, I'm also a full-back when I play. He's reliable, he doesn't try and be fancy, he's just 'what you see is what you get'. First time I saw them win the Littlewoods Cup, think it was 86/87. That was my first experience seeing Arsenal win a trophy. Q. Where do you watch Arsenal in Albury? I would normally watch it at home, sometimes I'll head down to the Celtic Club when I'm in Melbourne. I never went to Highbury. Even if I did go there, I'll still go with Emirates based on what the place has managed to do for us as a football club. I think we'll finish top three. I don't think we'll win it, I think the other contenders are strong and I think our true test is yet to come. Aaron Ramsey for me. He's had a great season so far and I think he's going to score more decisive goals. I also think Eisfeld is one to watch, as we get more fixture congestion he will get the chance to play more games.